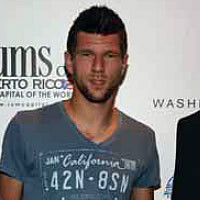 Austrian Tennis Champ in Washington, D.C. The Austrian tennis champ Jürgen Melzer, currently ranked 21st in the world by the ATP World Tour, met with Hans Kordik, Counselor for Agriculture and Environment at the Austrian Embassy, on the occasion of the ATP 500 Tournament “Legg Mason” on July 31, 2011. Dr. Hannes Androsch in Washington, D.C. Roll Over America to Washington, D.C.